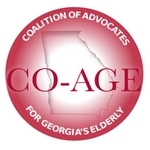 The session is just barely over, but advocates, CO-AGE and GCOA are eager to know what issues are facing Georgia's seniors. What should be the focus of next year? Do you have an idea? Submit an issue for our CO-AGE call for issues. Read the framework and guidelines on our web page and use the link to access the submission form!